Richard Desmond’s listings magazine TV Pick is to cease publication less than six months after launching. The title was unveiled by Northern and Shell in February, describing the UK’s best-selling magazine TV Choice as its “nearest rival”. TV Pick launched with a cover price of 40p – 5p less than TV Choice – before a price war ensued between the titles. 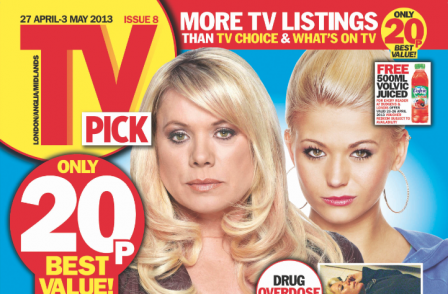 In May, TV Pick’s cover price had been reduced to 20p. On launch, Northern and Shell said that readers would be given a free ticket for Desmond’s Health Lottery. Northern and Shell confirmed the closure of TV Pick, with tomorrow’s edition being the last, but chose not to comment further.